During the spring semester, I acquired a clay whisky jug from the Phoenix Lab, which contains artifacts recovered from the excavation of MARTA lines in the 1970s. Dr. Robin Wharton has worked with students in her multimodel composition course to scan and model objects from the collection, and discussed the process in Atlanta Studies. In this case, the purpose was to experiment with photogrammetry for larger objects, testing the equipment and software that the Library has acquired. 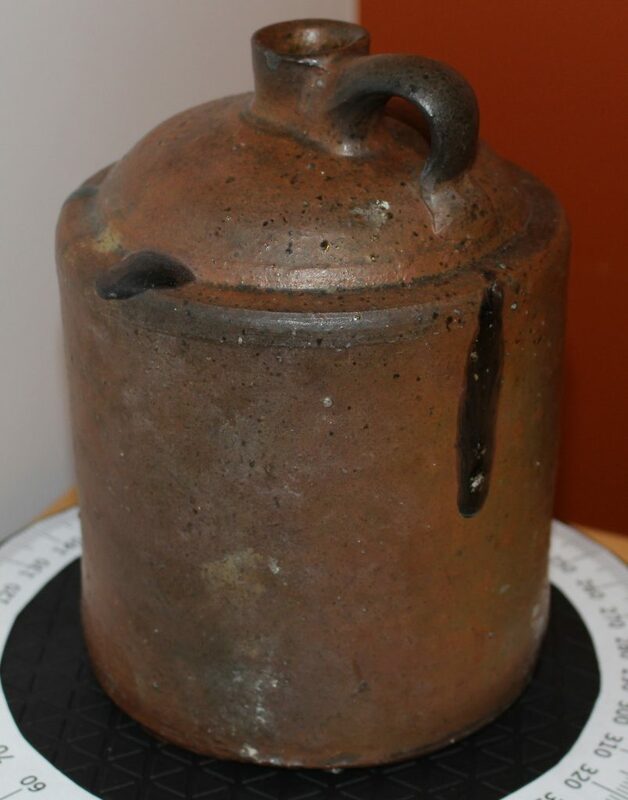 The jug is roughly 8 inches high and 6 inches in diameter, with a circumference of 19 inches. The jug wears the story of its life. The outside is worn and pitted, and carries a few kiln drips, where the kiln bricks melted and dripped on to the jug as it was fired. These drips show as dark splotches on the outside of the jug. Stamped on the top shoulder of the jug are two names: T.W. Cofield and E.C. Brown. To capture the entire jug in detail, I took images of the jug at 15 degree intervals on three elevations. I used Agisoft Photoscan to assembled the images into point clouds, meshes, and then textured models. I then pinned the three partial sections together, which resulted in a full model of the jug. In the finished 3D model, you can manipulate the jug to see its details and textures, including the stamped inscription with the two potters’ names. Thomas William Cofield and Edward C. Brown were cousins who lived in the Howell’s Mills area in northwest Atlanta, near present-day Buckhead. Edward’s father was Bowling P. Brown, a potter. His grandfather was Bowling Brown, also a potter, who had moved the family from Jugtown (an unofficial name) on borders of Upson and Pike counties. 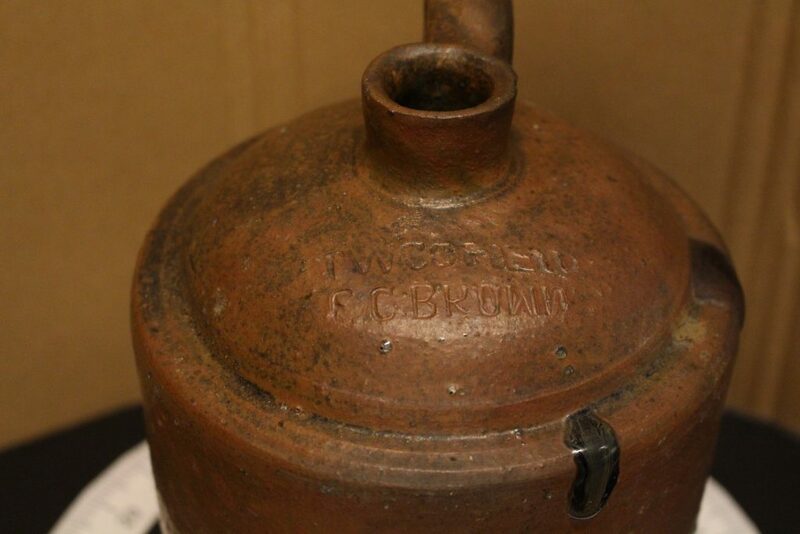 In his history of Georgia’s folk pottery, John A. Burrison suggests that Thomas and Edward worked together no later than 1911, after which Edward “became a gardener (and later foreman) at Grant Park.” Based on this suggestion, we can infer that the whisky jug is at least 106 years old. The jug is in remarkable shape for its age, but I still wouldn’t recommend drinking from it. John A. Burrison, Brothers in Clay: The Story of Georgia Folk Pottery (Athens, GA: University of Georgia Press, 2008), pp. 71, 168, 191, 195, 199. This entry was posted in Anthropology, For Faculty, For Graduate Students, For Students, History and tagged 3D modeling, Atlanta, Digital Scholarship, technology. Bookmark the permalink. I appreciate how this project (and your post) drew from the wealth of GSU resources. Fantastic article, Spencer, and a genuinely entertaining read!